Bunnie Huang will discuss manufacturing and scaling in Shenzhen and his experience working with Media Lab students this summer to create a hybrid tech platform/supply chain solution. 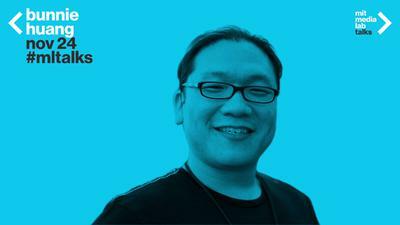 He will be joined by Joi Ito and Nadya Peek. Bunnie Huang is best known for his work hacking the Microsoft Xbox, as well as for his efforts in designing and manufacturing open source hardware, including the chumby (app-playing alarm clock), chibitronics (peel-and-stick electronics for craft), and Novena (DIY laptop). He received his PhD in electrical engineering from MIT in 2002. He currently lives in Singapore, where he runs a private product design studio, Kosagi, and he actively mentors several startups and students of the MIT Media Lab. Andrew "bunnie" Huang in conversation with Nadya Peek and Joi Ito.